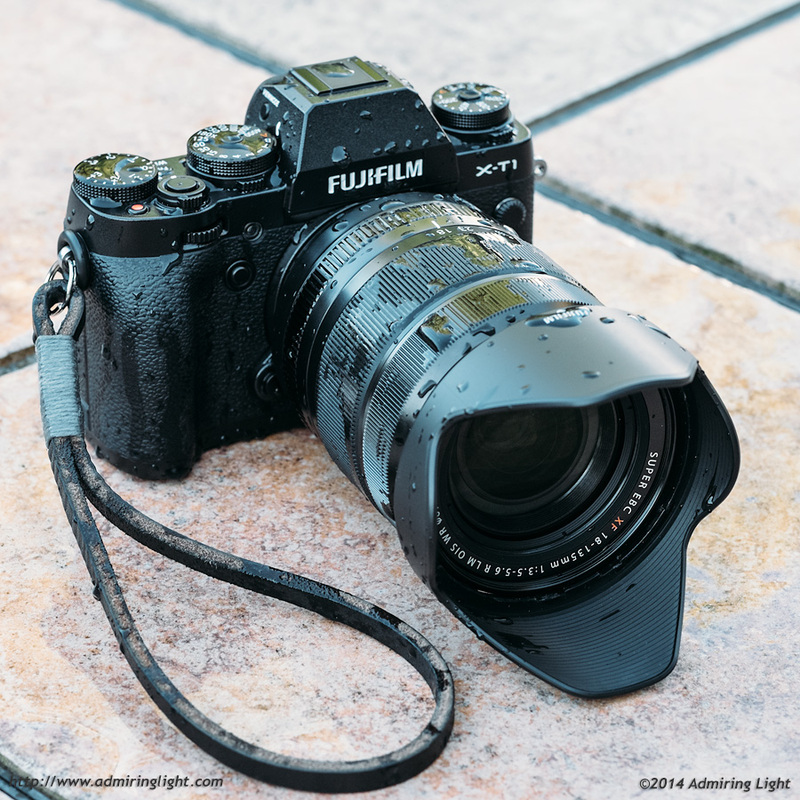 Fuji has done a great job in building a robust lineup for their X-Series mirrorless cameras, but despite releasing the weathersealed X-T1 earlier this year, they hadn’t created a weathersealed lens until now. The XF 18-135mm f/3.5-5.6 R OIS WR is a wide range super-zoom lens that features Fuji’s new Weather Resistant tag, with rubber gaskets around all points of entry and even a novel ventilation system to allow air to enter and leave the lens without sucking in moisture and dust. The lens covers a great range of focal lengths, equivalent to the field of view that a 27-205mm lens would have on a full frame camera. The one big up front question with this lens is whether it’s worth the rather high $899 price of entry. Let’s take a look. If you are familiar with Fuji’s 55-200mm f/3.5-4.8 telezoom, then you already know predominantly how the new XF 18-135mm is constructed. The lens has a similar build with a metal mount, high quality plastic body shell, aperture ring, well-damped and rubberized zoom ring and a metal front filter ring and hood bayonet ring. However, the 18-135mm is a weather resistant lens, and as such, there are subtle differences in the construction and feel. The aperture ring still moves similarly to those on the 55-200mm or 18-55mm, but there is a different feel to its motion due to the weather sealing. Likewise, the zoom action is mostly similar, except near the end of the zoom range. There is gasketing in the zoom extension mechanism to prevent water intrusion when using the lens at longer focal lengths, and you bump up against it as you near 135mm. As a result, there is a spongy resistance at the long end of the zoom that makes it more difficult to turn to 135mm than to other focal lengths, which, to be honest, is a bit annoying. 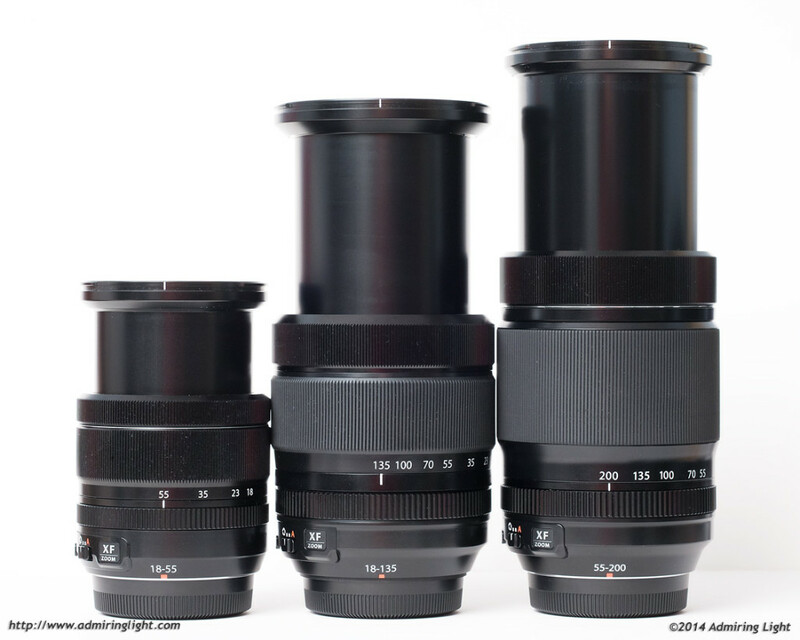 The lens is fairly large for a mirrorless lens, and weighs slightly less than the 55-200mm. It’s not a lens that I would recommend for use on the small X-M1 and X-A1 bodies, but it handles fine on the X-T1 and the X-E2 (with the added grip). Considering the range, its primary use will be as a single lens solution that can take the place of multiple lenses when you want to simplify what you’re carrying, and due to that, its size isn’t a major issue. The lens does extend towards the long end, adding several additional inches to the length. 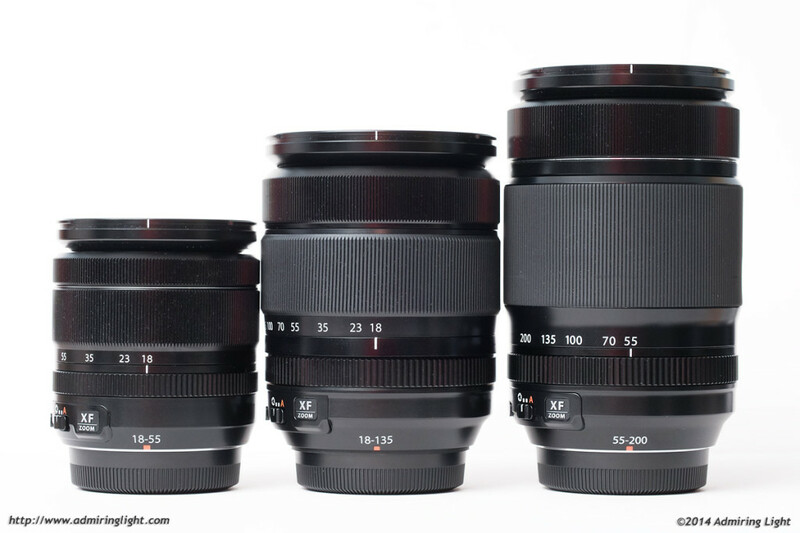 Below is a size comparison of the lens with the 18-55mm f/2.8-4 and the 55-200mm f/3.5-4.8. As has been mentioned, the XF 18-135mm is Fuji’s first weather-sealed lens. There are gaskets around moving parts on the lens, a rubber gasket around the lens mount and a unique ventilation system to ensure water and dust don’t get sucked into the lens while zooming. I took the lens out on my X-T1 in some rain to shoot for a few minutes to test out the sealing, and for the most part, it performed well. No moisture made it into any part of the lens or camera body, and everything worked flawlessly. The XF 18-135mm is Fuji’s first ‘weather resistant’ lens. However, I am disappointed in the sealing at the lens mount. I’ve owned several weather sealed bodies and lenses, and most use a thin rubber gasket that presses up against the lens mount on the camera to create a seal. Oddly enough, the rubber gasket that surrounds the mount on the 18-135mm doesn’t actually make contact with the face of the lens mount on the camera. Instead, it surrounds the metal of the camera mount. Unfortunately, this relies on the rubber properly fitting flush to the outside of the mount, and the problem is that it doesn’t fit flush to the surround. As a result, the rubber mount gasket only serves to deflect the water around the mount instead of actually creating a seal against it. After I came in from my brief shoot in the rain, I toweled off the lens and camera. To my surprise there were several drops of water that had made it past the gasket and were sandwiched between the metal mounting surfaces of the lens mount. While no water made it beyond the lens bayonet and into the camera, I have to think that if you’re shooting in heavy rain for more than a few minutes, the potential for water to make it into the camera is there. So while the weather sealing for the 18-135mm is good enough to keep your lens and camera safe in some light drizzle or if you are caught unexpectedly in a storm, I would not rely on it for protection of your gear in a steady rain. Frankly, I’m quite surprised that this oversight was made considering the apparent quality of the sealing everywhere else on the lens. Like the other recent Fuji zoom lenses, the 18-135mm features a very quiet linear motor (the LM in the lens designation). This gives the lens rather quick focusing capabilities. In good light, focus is fast and accurate, and can be used for most any purpose, including continuous autofocus outdoors. In lower light, the slower f/5.6 maximum aperture at the long end limits the light that can be used for focusing and results in the lens slowing down a bit. In dark conditions, autofocus is fairly slow, but in most situations, I had no complaints. One thing that is excellent about the 18-135mm is the ability for the lens to focus to .48m at all focal lengths. As a result, the lens is excellent for shooting closeups, and this ability truly makes the 18-135mm a versatile lens. While you’re not going to shoot macro images with the 18-135, the maximum magnification is approximately 1:4, which is great for closeups of flowers or larger insects like butterflies or dragonflies. One of the big features of the 18-135mm is its new refined optical image stabilization (OIS). Fuji is claiming an unheard-of 5 stops of stabilization for this lens, and for the most part, it’s a fairly accurate claim. While I wasn’t able to regularly achieve 5 stops of handholdability (which is equivalent to around 1/6 second at 135mm), I was able to consistently get sharp shots at 1/10 second at 135mm, for a gain of more than four stops, and I did occasionally get a 1/5 second sharp shot at the long end. It is among the most effective optical stabilizers I’ve used. First of all thank you for your excellent review. I must say that I’ve read a few where I had to wonder if the reviewer even knew how to hold a camera. Obviously you do. Now, may I bother you by asking if the latest firmware for both the lens and the body were available at the time of your tests? Yes, both lens and camera were on the latest firmware. 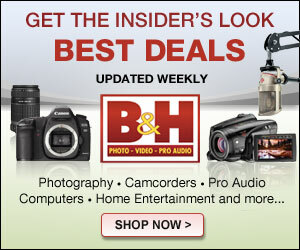 Very good review of the Fujinon 18-135 Zoom! As a micro-stock photographer whose main “Focus” is sharpness and image detail, I am researching a smaller, lighter kit for travel, but without sacrificing Quality. So, being that I have the D5300 and very sharp16-85 Zoom-Nikkor, would you still recommend the Fuji XT-1 as a Quality “travel” kit that would maintain (or exceed!) the sharpness I’m getting from the D5300? 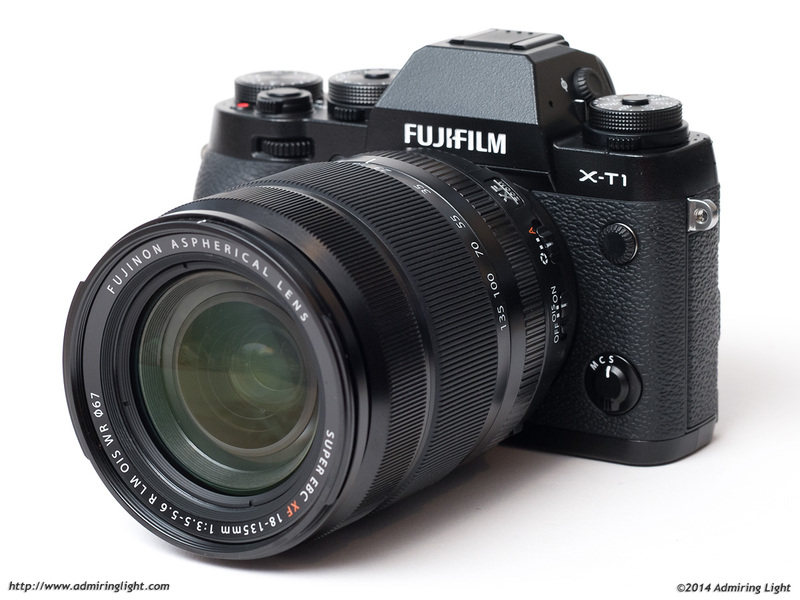 Excellent review for a revolutionary lens, at least within Fuji X-line lenses. I’ve found it in Belgium for 700 euros, right now, but I just hoped the image quality would be on par with XF 18-55mm. But as you say, the XF 18-55mm performs better. I have only primes lenses for my X-Pro1 and I just wanted a good XF zoom lens to closely match the image quality I get from my XF 18mm F2.0 and XF 35mm F1.4. Maybe I should wait for the upcoming XF 16-55mm F2.8 WR (with or without OIS)? This lens was included with my X-T1 as Kit-Lens. I had the choice between this and the XF 18-55/2.8-4.0 which I both got to test for 3 days. Optically, the 18-135 is rather Canikonish in APS-C Kit-Lens terms. Except for its colour and bokeh, where the Canikons are rubbish and the Fujinon is good. The 18-55 however is far better in every optical departement. Never the less I got this for good reasons, which potential Kit-Buyers might want to consider. 1) Weather sealing. As opposed to your observation, I had no issues with it. I took it across Mali, Burkina Faso and Ghana and it kept moisture AND Sahel-Dust out. Sahel Dust is the most penetrating matter in the universe. 2) It has the best IS of any lens I ever used, including my 70-200/2.8L The 18-55 performs rather poor at this. 3) It (My copy) has the nicer to operate apperture ring. 4) I have the focal length range of the 18-55 covered with primes. At this time I have the 16/1.4, 35/1.4 and 56/1.2 and each of these lenses does everything much better than the 18-55. Be aware that the 56/1.2 – unlike e.g. the specialist 85/1.2L – is not “just” a portrait lens, but a very fast short telephoto, suitable for just about anything you throw at it. 5) It has great ergonomics and a “pro-zoom” feel to it. The 18-55 is too small, too fiddly, too glove unfriendly for me. I use this lens for snaps of the Kid’s, family events and the like, or if I have to pack tight and rugged. I use this lens because it is convenient and easy to shoot with. However, for more serious photography you have to allways factor its shortcomings into your composition, which i find rather tedious. From everything I’ve read and seen, including the images here (that all look soft to me), this may turn out to be Fuji’s first sub-standard XF lens. To my mind it belongs with the XC series, but at a lower price, for folks who are prepared to compromise optical quality for convenience (and value… if it were priced according to its performance). Good article however I wish you had shown an image of the rubber seal against the camera. I just bought this lens and I cannot see any gasket anywhere.